Botanical folk medicines such as European chestnut (Castanea sativa) have been used in the treatment of skin infections since ancient times. The traditional folk remedy inspired a new study published in the peer-reviewed journal PLOS ONE. Researchers have discovered that the high amount of oleanene and ursene derivatives found in European chestnut leaf extract can deactivate the harmful staph bacteria Staphylococcus aureus virulence (S. aureus) and the development of related diseases without detectable resistance. S. aureus can cause various infections, such as boils, cellulitis, food poisoning, impetigo, toxic shock, and pneumonia. The discovery holds promise for future prevention and treatment methods in methicillin-resistant S. aureus (MRSA) infections without the issue of drug resistance. According to the Centers for Disease Control and Prevention, antibiotic-resistant bacteria can affect at least two million people and lead to around 23,000 deaths each year. “Local people and healers repeatedly told us how they would make a tea from the leaves of the chestnut tree and wash their skin with it to treat skin infections and inflammations,” adds Quave, who previously conducted hundreds of field interviews in South Italy and other areas of the Mediterranean. In the study, Quave teamed up with a microbiologist from the University of Iowa, Alexander Horswill. The lab at Iowa focuses on creating drug discovery tools like glow-in-the-dark staph strains. 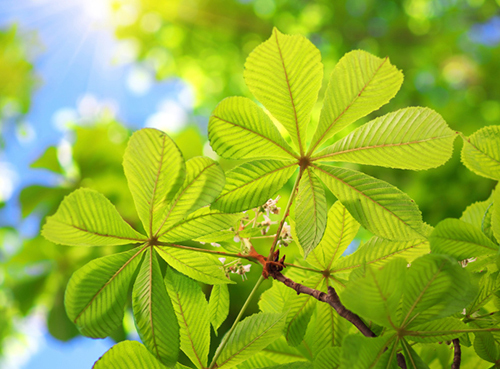 Researchers steeped chestnut leaves to extract 94 chemicals—oleanene and ursene were the most potent. Tests found that the chestnut extract inhibited the staph bacteria’s ability to communicate. This is called “quorum sensing.” The process is used in MRSA to ramp up its virulence and manufacture toxins. A 50-microgram (mcg) dose of the extract cleared up MRSA-related skin lesions in mice. It also stopped red blood cell damage and tissue damage. Quave, C.L., et al., “Castanea sativa (European Chestnut) Leaf Extracts Rich in Ursene and Oleanene Derivatives Block Staphylococcus aureus Virulence and Pathogenesis without Detectable Resistance,” PLOS One August 21, 2015, doi: 10.1371/journal.pone.0136486. Emory Health Sciences, “Chestnut leaves yield extract that disarms deadly staph bacteria,” EurekAlert! web site, August 21, 2015; http://www.eurekalert.org/pub_releases/2015-08/ehs-cly081815.php. “Antibiotic Resistance Threats in the United States, 2013,” Centers for Disease Control and Prevention web site; http://www.cdc.gov/drugresistance/threat-report-2013/, last updated July 17, 2014. “Staph Infection (Staphylococcus Aureus),” MedicineNet.com, http://www.medicinenet.com/staph_infection/article.htm, last accessed August 24, 2015.